One of my favorite parts about blogging is getting to explore the world with Cameron. We typically spend about 15-20 minutes shooting content, and then always make time to take in our surroundings and spend time together, whether we're halfway across the world or right down the street from our house. We recently spent an afternoon exploring Marathon Village. We've been several times together but the creative community of Marathon always makes for a nice little afternoon getaway. Marathon Village is a unique, industrial area of town with a rich history. In the early 1900's it housed Marathon Motor Works. Fun history fact for you: It was the first factory to totally manufacture automobiles in the southern United States. Now the area is home to a community of retail stores, businesses and even a music venue. I threw this outfit together in about five minutes as I was rushing out the door to beat the rain, and I love how it turned out. 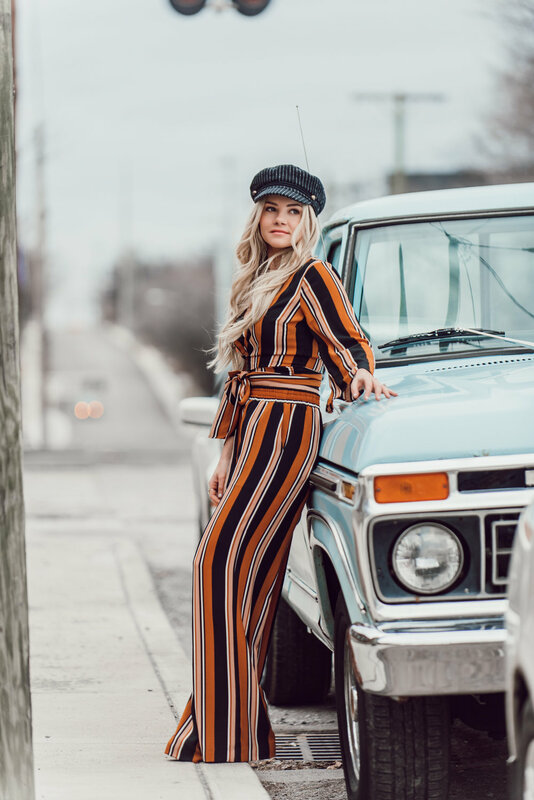 I really can't get enough of the 70's vibes of this striped set. It also comes in a vibrant blue color. The front tie crop top is super flattering with the wide leg crop pants. I'm wearing a size small in both. The pants were a little long, but nothing some platform heels and a hemming can't fix. I'm 5'1" for size reference. Now on to the fun part: accessories. I wasn't sure how I felt about the cabby hat trend, but I've learned it's all about finding the right one for you. I scored this pinstripe cabby hat for only $12. I especially love the gold button detail. It's hard to pick favorites when it comes to Kristalize earrings, but these faux leather feathers might take the cake. I want a pair in every color! I really have a thing for their beaded bracelets statement jewelry. Be sure to use code "HUNTER" for a discount on the whole site.